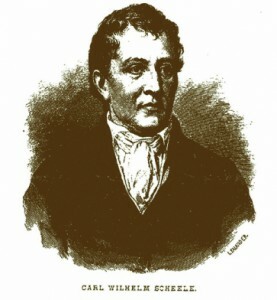 Carl Wilhelm Scheele, one of the world’s foremost chemists, was born in 1742 in Stralsund, Germany, at the time a part of Sweden. At the age of 15, he moved from Stralsund to Gothenburg to become a pharmacist. He stayed in Sweden and became an internationally recognized scientist during his relatively short life. He died in 1786 at the age of 44. Scheele first moved to Stockholm and then to Uppsala, where leading scientists such as Retzius, Berzelius and Bergman soon learned to appreciate his work. Scheele finally settled in the small town of Köping, where he combined his work as a Pharmacist with his passion for research. Scheele discovered eight unknown elements, which is more than any other scientist has ever achieved! He further discovered nine unknown organic acids at a time when only as few as 4 organic acids were known! Scheele is best known for his groundbreaking discovery of oxygen and the chemical elements chlorine, manganese and tungsten. His findings were applied in areas such as catalysis, steel production and photography. ?The Royal Swedish Academy of Sciences quickly realized Scheele’s potential and hence he was the first person ever to be appointed a member before he even had a proper college degree! He was also appointed as a member of the internationally recognized scientific academies of Turin, Paris, Verona, and Erfurt. ?Scheele was regarded as a straightforward person – a man who spoke his mind. It was said about him that he had ”eyes like fire”. We do not know exactly what Scheele looked like since there are no photographs of him, but the image of him as a tenacious, focused and passionate world class researcher is crystal clear. He used all his time and energy on research, at a time when research was both tedious and dangerous.